"The Architecture of Barry Byrne"
Frank Lloyd Wright’s apprentice brought the Prairie School of Architecture to Europe. We take a look at the innovations of architect Barry Byrne with Vincent Michael, the author of The Architecture of Barry Byrne. Read an excerpt from the book and view a slideshow. In his youth Barry Byrne absorbed Louis Sullivan, Frank Lloyd Wright, and Irving Gill and yet was not a disciple of any of them. His buildings express the wall plane in a manner unlike Wright’s, evince a geometric abstraction unknown in Sullivan and a textural wealth absent in Gill. Formally restrained, they have a delicacy of scale, proportion, and detailing absent in the vernacular and a crisp serenity that elevates without resorting to ecstatic forms. Contemporary assessments of Byrne’s work lauded his liberation from Prairie school stylisms and his masonry expressionism, derived from Sullivan and similar to second-generation European modernists Hans Poelzig, Erich Mendelsohn, and Hans Scharoun. His formal affinity to the Europeans, and his unique 1920s relationship to European modernism push him out of the typical architectural history narrative. He designed schools that exemplified the functional articulation of modernism in their planning and paralleled European expressionism in their textured masonry forms. In the postwar years Byrne helped define the “new solidity” of mid-century modernism. Byrne’s architectural reputation has always been strong. Carl Condit, who codified the Chicago school in the 1960s, praised Byrne’s “vigorous imagination” and recalled his “uncompromising adherence to an increasingly unpopular doctrine” in the 1920s. H. Allen Brooks lauded Byrne for carrying the Prairie school forward while others gave in to the demand for eclectic styling. Stuart Cohen celebrated Byrne’s “volumetrically articulated work” and “compositional ability” and championed his 1916 Kenna Apartments and 1936 Williams house. Sally Chappell said, “Francis Barry Byrne became the most original of all the Oak Park Studio apprentices.” Walter Netsch credited Byrne’s 1916 Kenna Apartments building with inspiring him to become an architect. Barry Byrne attempted to bring the challenge of modernity in function, design, and construction to Catholicism. This position is clearly outside of Pevsner’s universe, and even later historians who broadened the field of modernism insisted, as Goldhagen notes, on linking architects’ ideologies to their aesthetic practices, pushing Byrne further into the shadows. Modernism was a cause, a movement, and churches—especially Catholic churches—did not fit its ideology. Karl Moser, Auguste Perret, and P. V. Jensen-Klint appear in architectural histories for formalist triumphs that happen to be churches, but for Americans, separation of church and state is a doxology even in architectural history. Of the 612 buildings appearing in Vincent Scully’s American Architecture and Urbanism, only fifteen are churches, none from the half-century between 1910 and 1952, when Byrne worked. A 1997 survey of religious architecture in America’s regions overlooked Byrne while otherwise citing buildings he directly influenced, such as Bruce Goff’s Boston Avenue Methodist Church in Tulsa. Guides to Chicago praise Byrne, although he designed but one church there, and half of his output has been demolished. His work is spread scattershot throughout North America, and he never designed a really big building or a cathedral. His single European commission in Ireland is often overlooked outside that country. Barry Byrne completed the working drawings and was the constructing architect for the one American church in every survey—Frank Lloyd Wright’s Unity Temple. Churches are ignored by modernist architectural history until the 1950s, when Le Corbusier, Eero Saarinen, and Marcel Breuer brought their already legendary status to worship spaces. Byrne was building modernist churches in the 1920s while Le Corbusier and Mies were focused on flats and factories, and Alvar Aalto’s churches were still employing baroque ornament. The visual reigns in the fine arts, and the “mental image” endures every attempt of the rational mind to banish it. The radical exterior forms of churches by Jensen-Klint, Perret, Moser, and Böhm carve modernity on our memory and we ignore the staid Gothic of their groundplans. But thanks to the stylistic periodization perpetuated in architectural history, Byrne’s 1920s innovations are ignored. So much of Byrne’s innovation is visible only in plan, where he discarded the past more resolutely and completely than any of his contemporaries. Even his rhetorical contributions to the modernist discourse were set largely within the Catholic tradition, excising them from a wider discourse. 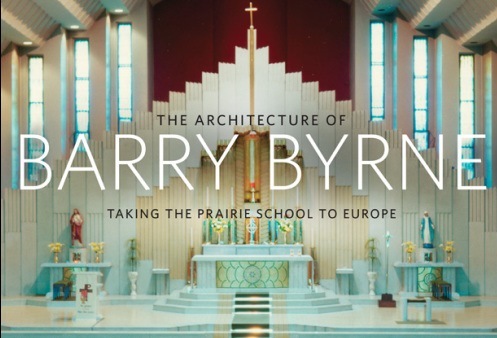 Barry Byrne’s modernity, in form and rhetoric, occupies a position not easily fitted to the histories of modernist architecture. From The Architecture of Barry Byrne by Vincent L. Michael. Copyright 2013 by the Board of Trustees of the University of Illinois. Used with permission of the University of Illinois Press. No part of this excerpt may be reprinted, reproduced, posted on another website or distributed by any means without the written permission of the University of Illinois Press.